WAITSFIELD – Last night marked the Infernal Equinox, the one night each year when Glacio-Americans come together for one last night of dancing and debauchery before melting away into the background until the ice and snow comes again in September. Dozens of local participants gathered in Waitsfield, transforming a clearing in the woods into a raucous frolic of frigid proportions. Led by local mainstay Olaf (no last names are given at the event), the group began by paying tribute to Frosty, widely believed to be the first Glacio-American and the originator of the event. According to the ritual, Frosty was taken up into the sky over the fields of snow, but each year on this day they pray for his safe return, as scriptures say he will “be back again someday.” It has been decades since Frosty melted, but the group in Waitsfield has not given up hope that he’ll be back. A fire is lit in the center of the clearing, and most of the dancers keep a safe distance from it as they spin and twirl into the night. Only Olaf, always a commanding presence, seems comfortable close to the heat. It almost seems as if he enjoys the danger, as his shrill laughter rips through the cold night air. The jubilation continues throughout the night, although there are noticeably fewer and fewer folks still there as the stars trace their ancient paths across the sky. By dawn the fire is ashes and coals, the merriment is over, and the sun peeking out over the mountains reveals nothing in the clearing but puddles. The Infernal Equinox is over, and the spirits have gone to wherever they go to wait out mud season. 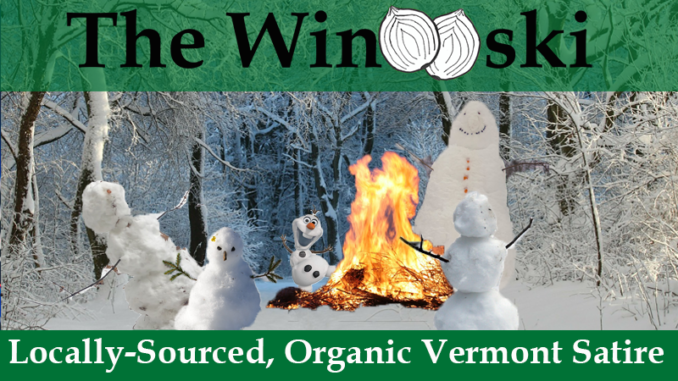 But when that first Vermont snow hits in late September, you can be sure that they will be back, chanting and stomping and welcoming the Abominable Equinox.